Although, Rakhi is majorly a north Indian festival, India is an incredible country where every festival is celebrated with equal zeal as you move from Kashmir in the north to Kerala in the south or from Rajasthan in the west to seven sisters in the east. Celebrate rakhi with by sending rakhi to Amravati. I know, all of us don't need any occasion to show our gratefulness towards our brother because at every moment of our life we express our gratitude to him. Festivals give us a reason to cherish those days in a flamboyant manner. FlowerAura has an excellent extensive assortment of Lumba Rakhi for bhabhi online with an option of free shipping. It is a type of hang-on which a brother ties to his sister in law’s bangle. Worried of the fact that like previous year, your brother won’t be able to come to celebrate Rakhi? Don’t be darling. Send rakhi gifts to Amravati at the doors of your brother without paying any extra charge for it that too with an option of same day delivery. To the abode of Lord Indra, Amravati, is incredibly famous among tourists for its amazing temples and pilgrim centers so instead of lamenting that why your brother stays there, appreciate it. And send rakhi to Amravati, the land of immortals with the facility of home delivery from FlowerAura. The origin of Raksha-Bandhan can be traced back to the mythological times, which recounts many stories on how this custom came into being. 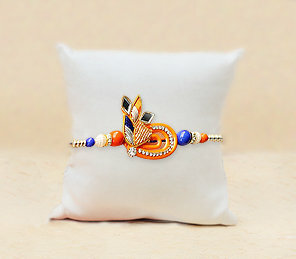 If you also believe in the belief that the thread of Rakhi has a strong power to hold the affectionate relation of a brother and sister, you must be searching for an exclusive rakhi for your brother, and our exquisite collection of rakhis and service of rakhi gifts delivery will not fail to impress you. We value your emotions more than everything else.